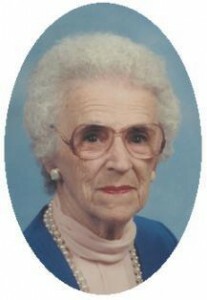 Beulah O. Prabst, 96, of the Harbor Club, 425 W. Walters St., Port Washington, formerly of Brillion and Hilbert, WI died Saturday June 25, 2005 peacefully at her home. She was born on December 22, 1908 in the town of Rantoul, WI, oldest the eleven children of Adolph and Elenora Wolf Behnke. In her youth she worked at the former Clores Grocery in Plymouth and I.K. Meyer Seed and Feed in Beaver Dam. She attended Sheboygan Business College and shortly after married Peter A. Vanderhoof of Bovina, WI on October 16, 1926 in Hilbert, WI. She and her husband returned to Plymouth and purchased the grocery; operating it until they moved to West Salem to operate their local movie house. After Peter passed away on May 9, 1951, she took a job with the Brillion Iron Works in the office. On November 10, 1956 she married Maximilian Prabst of Cascade, WI in Brillion. He preceded her in death in October, 1970. For many years she had worked at the Cascade and Waldo Post Offices until her retirement. In 1983, she moved to Port Washington to be near her daughter. She will be remembered for her strong faith and her quiet demeanor. After leaving the Brillion Iron Works she was instrumental in the formation the retired office workers annual dinner and social. She is survived by her children Merrill (Dolores) Vanderhoof of Brillion and Kay (the late Howard) Keller of Fredonia and step-daughter Mary (Dean) Duerst of Overland Park, KS; four grandchildren Jay (Shelley) Vanderhoof, Kim (Diane), Steven and Krystal Keller; three step-grandchildren Rebecca (Craig) Closer, Kathy (Duncan) Burdette and David (Michelle) Duerst; 7-great-grandchildren; 8 step-great-grandchildren; 4 great-great-grandchildren; one brother Richard (Sadie) Behnke of Las Vegas; one sister Marie (Lester) Berkholtz of Cape Coral, FL; further survived by nieces, nephews, other relatives and friends. She is preceded in death by her two husbands, daughter Patsy Lee Vanderhoof, son-in-law Howard Keller, granddaughters Sheri and Kitty Keller and siblings twins Iris Burner and Ivan Behnke, twins Floyd and Flora Behnke, twins Clorinda “Dolly” McGowan and Victor Behnke and Jerome and Leon Behnke. A memorial funeral mass will be celebrated at 6 PM Wednesday, June 29, 2005 at St. Peter of Alcantara Catholic Church, 1802 N. Wisconsin Street, Port Washington. The Reverend Pat Wendt, pastor will be the celebrant. Interment will in St. John the Baptist Catholic Cemetery in Plymouth, WI. There will be no visitation, family will receive family and friends after mass in the school hall with a luncheon and fellowship. Memorials to the church appreciated.